I’ve found myself making a lot of slow-cooked Sunday roasts recently. Apart from the bit where you have to get up early to get them in the oven in time, they’re such a fuss-free way of providing a generous lunch, giving you more time to enjoy the company of friends and family. 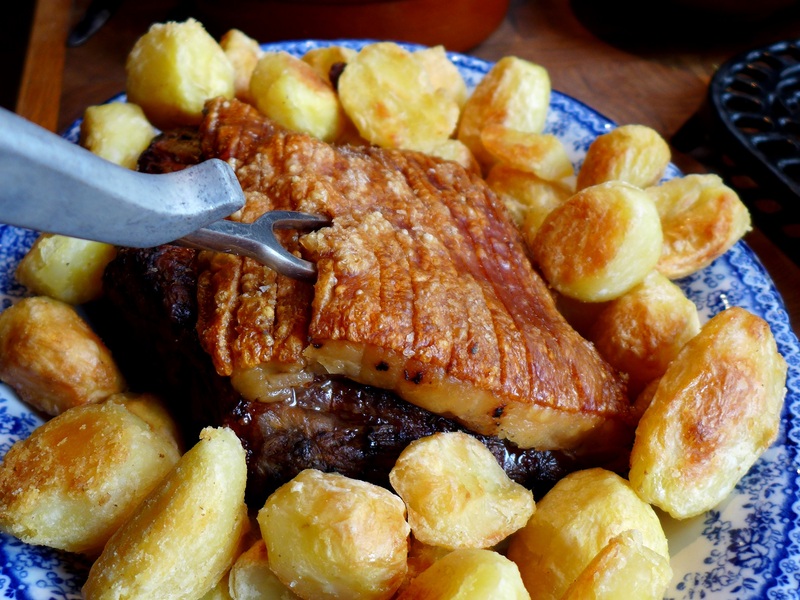 This porky version has the added advantage of quite stupendous crackling. I apologise for the paucity of pictures. By the time it came out of the oven we were far more interested in eating it than in photographing it. The pork will take six and a half hours to cook so plan seven hours ahead to allow time for the meat to come to room temperature and for the oven to warm up. 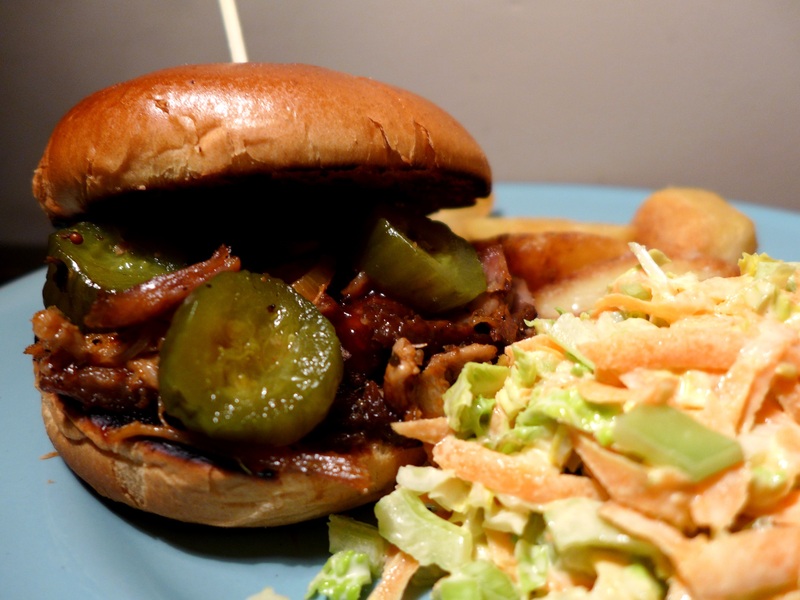 It’s worth cooking a big joint as the leftovers make fantastic pulled pork buns … more on that further down as this post is a twofer. Begin at least 24 hours before you want to start cooking. Make sure the pork skin is well scored and untie the joint if it’s rolled. 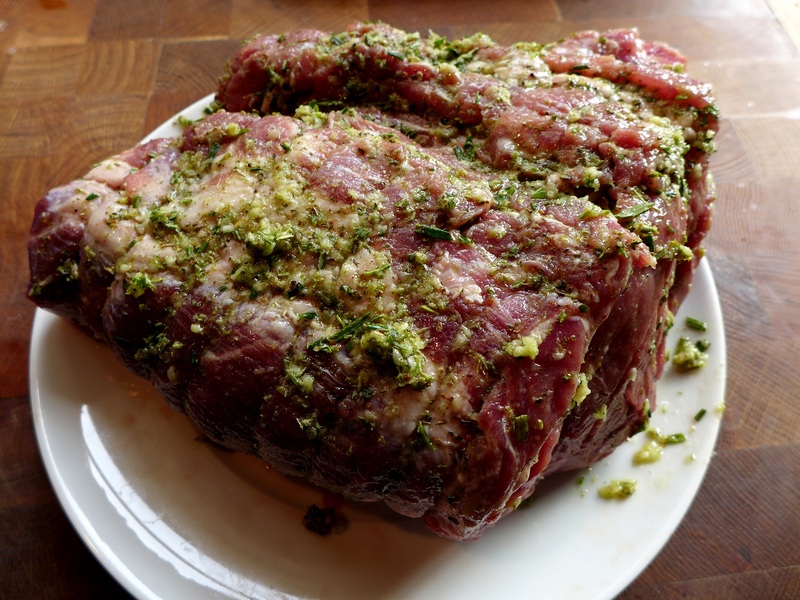 Mix together the oil, garlic, herbs and a good grind each of salt and black pepper and anoint the meaty side of the pork, not the skin, rubbing the paste well into all the nooks and crannies. Turn it over and place it meat-side down in a dish and cover loosely with grease-proof paper: plastic wrap is the enemy of crackling, you want the skin to dry out, not get sweaty. Refrigerate overnight or for up to two days ahead. Seven hours before you want to eat, take the meat out of the fridge and put the oven on at 150C/300F/Gas Mark 2. Peel the onions and roughly chop them, along with the carrots and celery. Place the vegetables in the bottom of a roasting tin. Rub the skin of the meat with a little oil and massage in a teaspoon of sea salt. Place the meat on top of the veg and pour in the water, taking care not to soak the skin. Cover tightly with a double layer of foil, place in the oven and cook for five hours. Then transfer the meat to another roasting tin, reserving the vegetables and pan juices. Turn the heat up to 200C/400F/Gas Mark 6 and cook the joint, uncovered, for about another hour and a half or until the crackling is brown and crispy. While it’s finishing, strain the pan juices into a large jug, and wait for the fat to separate. Skim it off and use the juices underneath to make your gravy … it’s one less thing to do at the last minute. I usually chuck in a glass or two of red wine and reduce it all down until it tastes suitably intense. Whisk in some beurre manié (equal quantities of plain flour and butter mashed together) if you’d like it to be thicker. You can save the stock vegetables for a soup if you like, or put them back in with the meat for the last half hour or so of cooking. Remove the meat from the oven and allow it to rest somewhere warm while you dish up any side vegetables and re-heat the gravy, then carve into thick slices, giving everyone a share of the crackling. If you have any leftovers, try making them into pulled pork buns. Whip up a quick barbecue sauce: 60g tomato ketchup, 1 tbsp each of Worcestershire sauce and soft dark brown sugar, 1 tspn cider vinegar, a pinch each of salt and mustard powder and a spoonful of something hot – I used smoked chilli paste – will give you enough for two people. Stir together over a low heat until the sugar has melted, adjust the seasonings to taste, and allow to cool. Shred the meat using a couple of forks and warm a little oil in a pan. Re-heat the meat in the pan, stirring so it doesn’t catch, and once it’s hot add a tablespoon or two of barbecue sauce. Don’t drench it or it’ll make your buns soggy and I think we can agree that no-one wants soggy buns. Pile it into toasted brioche buns, top with a little more barbecue sauce, thinly sliced red onion and some sweet and sour pickled cucumbers, and serve with a crunchy coleslaw on the side. Eat straight away, fries optional. This entry was posted in Mains, Pork, ham and bacon and tagged lazy lunches, pulled pork buns, slow cooked pork shoulder by Linda Duffin. Bookmark the permalink. My favourite roast! Actually all roasts are my favourite! … delicious! Your roast looks delicious, I have to try it. Great post. Thank you. I definitely will do this for a special Sunday lunch, probably during lambing. Beautiful. Though, the sheer omnipresence of pulled pork has turned me against it. I need to get over myself. Thank you. 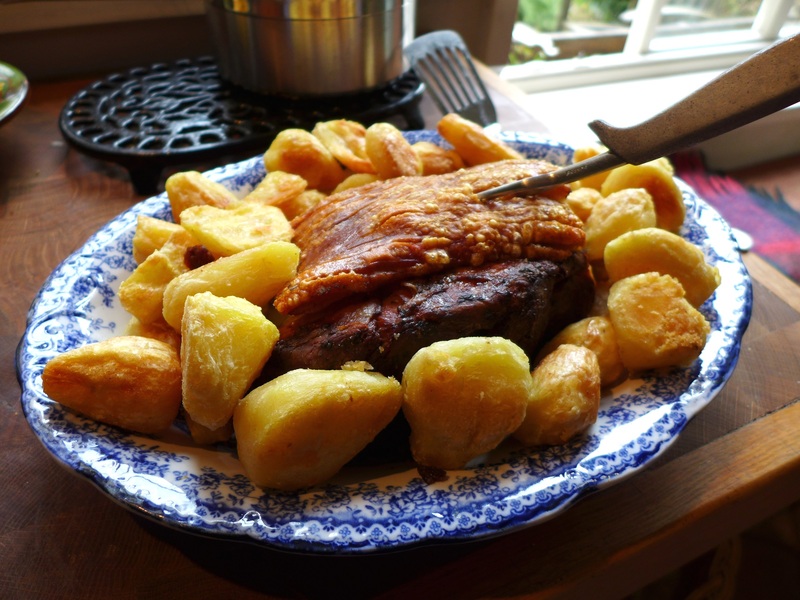 I only pulled it for the buns … we ate it plain old slow roast in thick slices for Sunday lunch. Exactly the way to do it. Though the buns looked great too. Oh, how I love pork shoulder. But those potatoes!